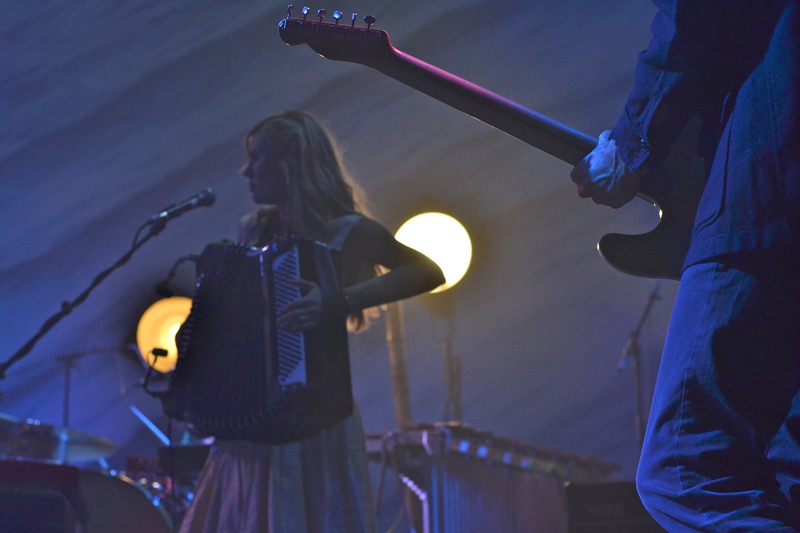 The 13 member band skipped onto stage a little after 8pm with instruments ranging from a trumpet to cello to banjos to an accordion. 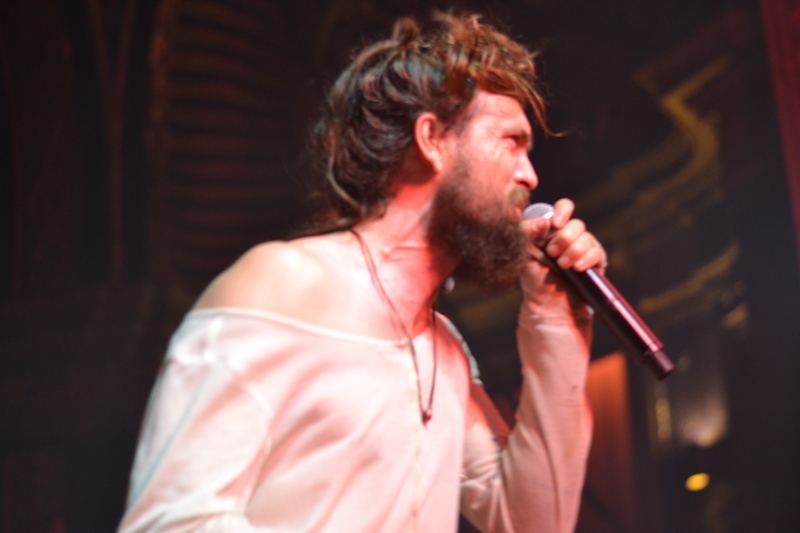 Ebert, dressed in a loose white sweater decorated with holes and a dreadlock/beard combo freely strolled into the packed theater serving as a charming compliment to female lead vocalist Jade Castrino. 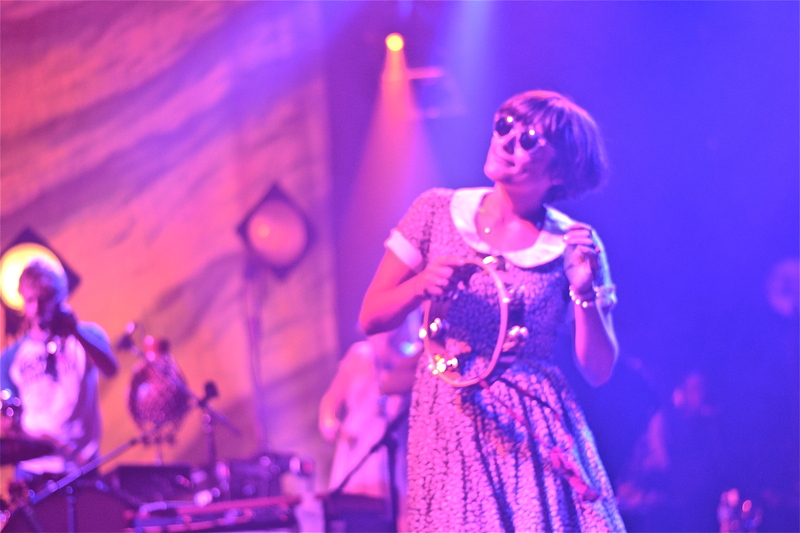 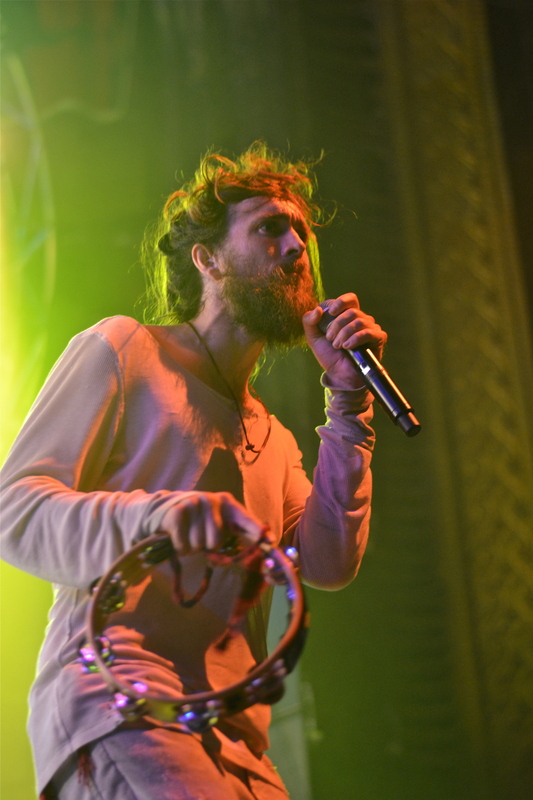 While every inch of Ebert’s body (as well as the cotton tail loosely affixed to his pants) vibrated to the rhythms of the music collective, female lead vocalist Jade Castrino’s tambourine fluttered as she twirled around in tie dye rainbow socks. 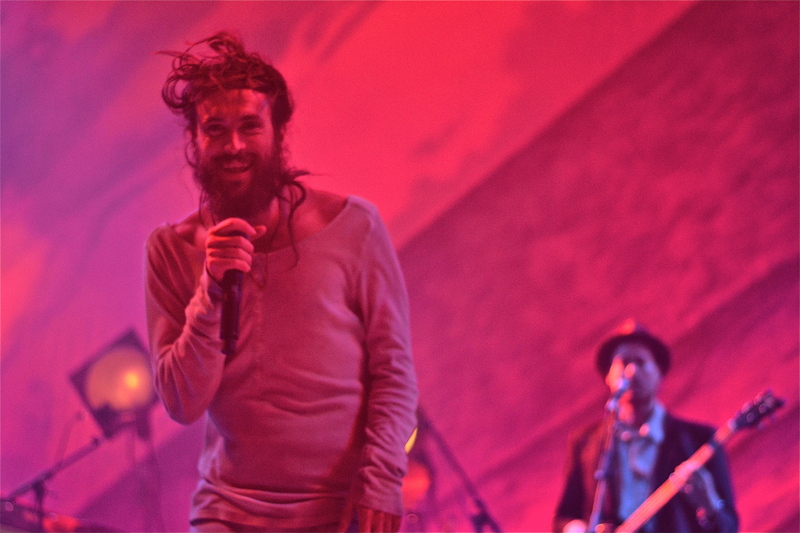 Edward Sharpe and the Magnetic Zeroes started their set with Up From Below and continued playing songs from both their first album as well as their upcoming release Here. 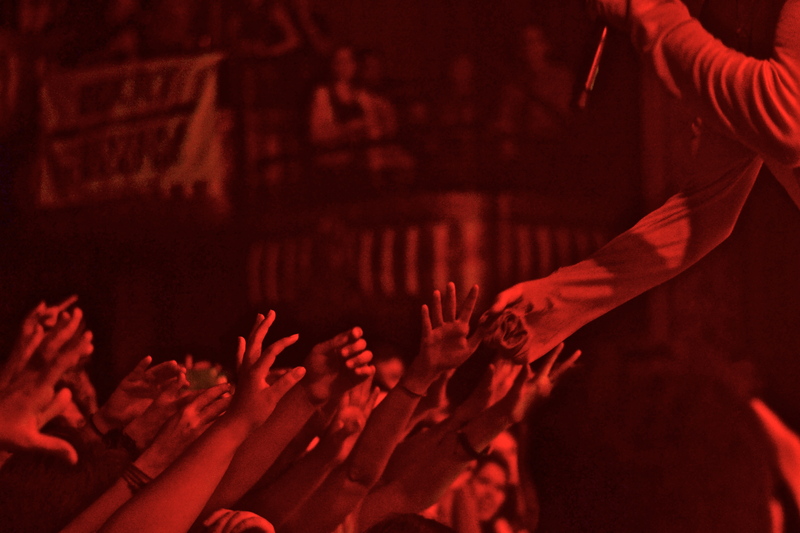 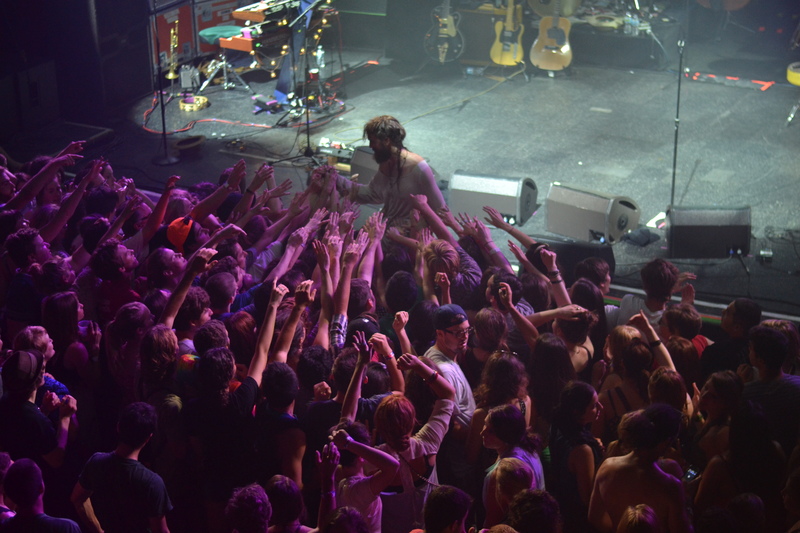 The entire show was a communal experience for both the audience and the band. 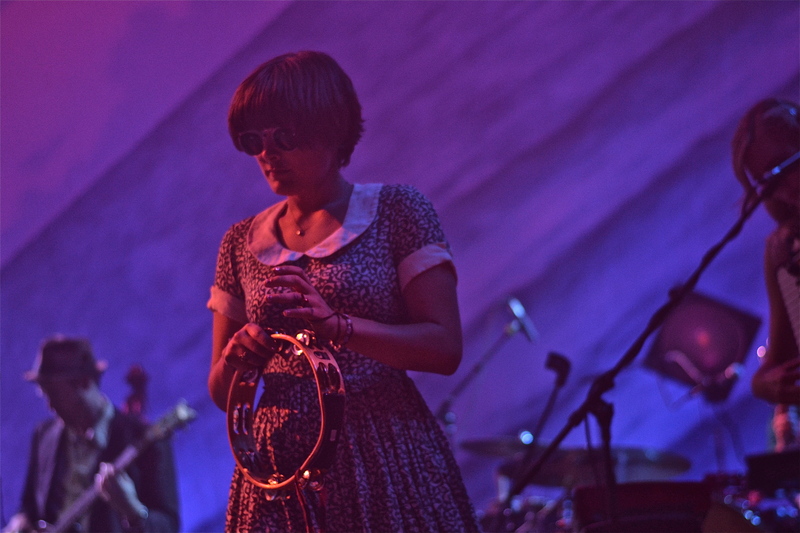 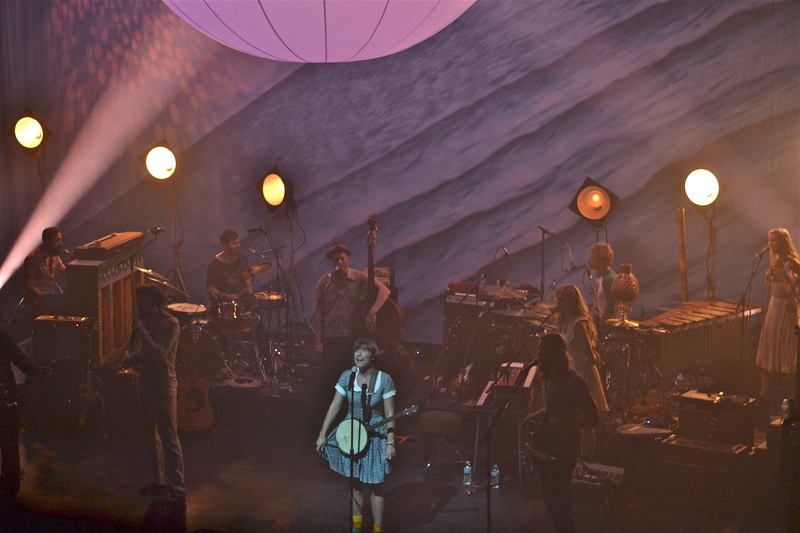 Under the light of a color-changing and hanging ball reminiscent of a giant peach – a the backdrop representing the Here’s cover art – every member of the Magnetic Zeroes vibed off one another beautifully. 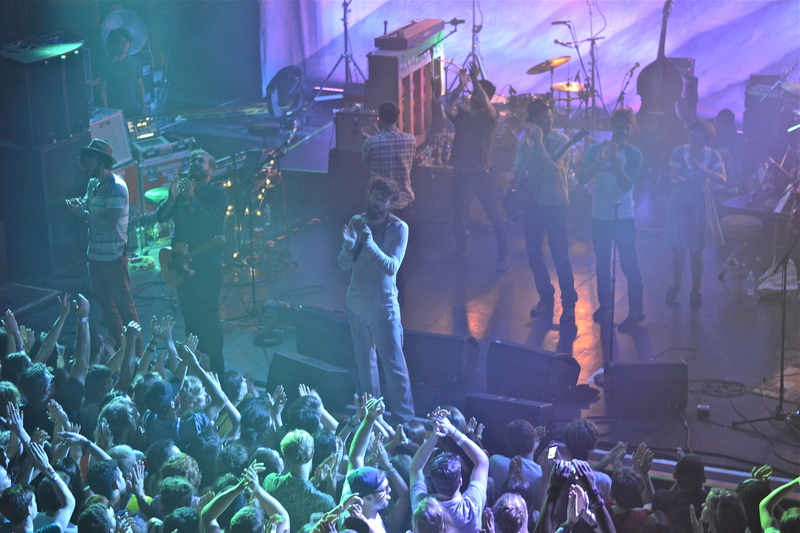 Ebert and Castrino’s voices produced a perfectly balanced harmony that stayed strong through the entire set. 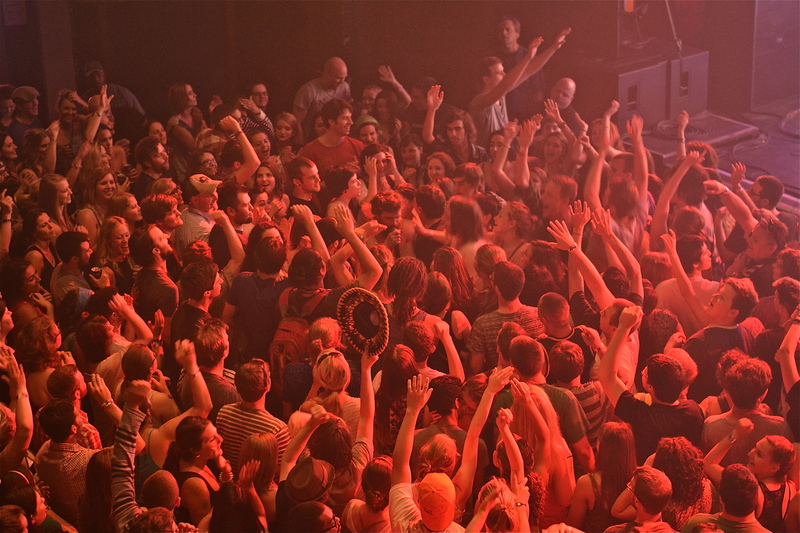 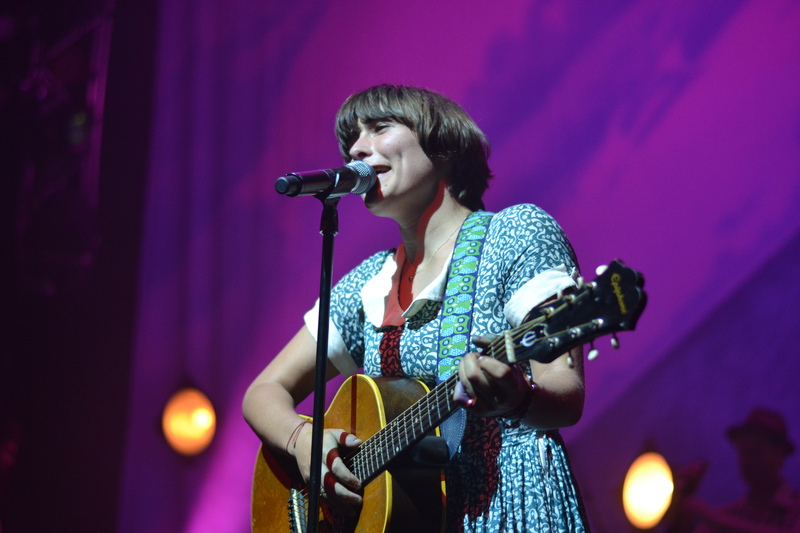 When the crowd favorite Home was played, the Riviera was turned into a singing chorus of genuinely happy people. 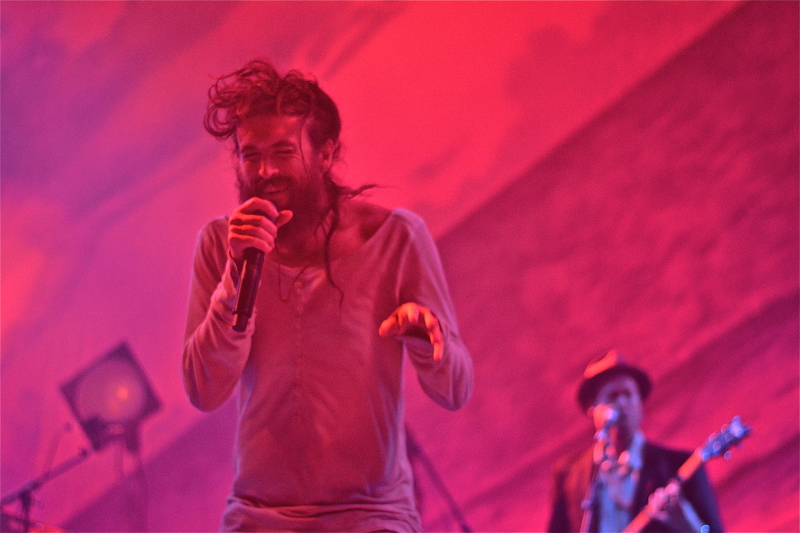 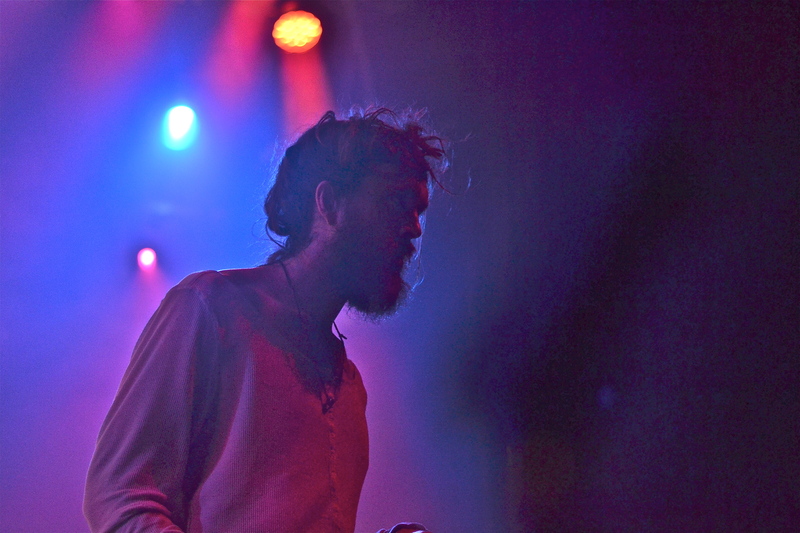 Edward Sharpe and the Magnetic Zeroes finished off the set with Om Nashi Me. 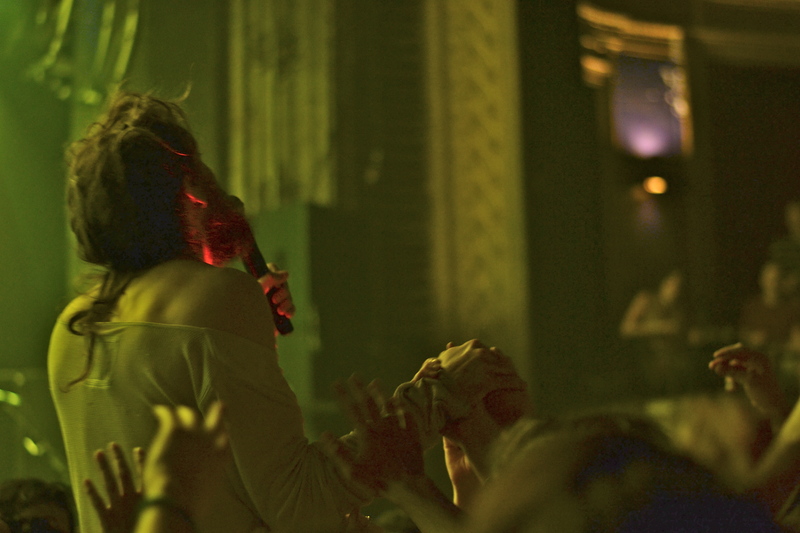 When the lights in the Riviera turned on and the Magnetic Zeroes cleared the stage, a sweat-drenched Ebert stayed glued to the audience, shaking hands and humbly thanking fans for attending. 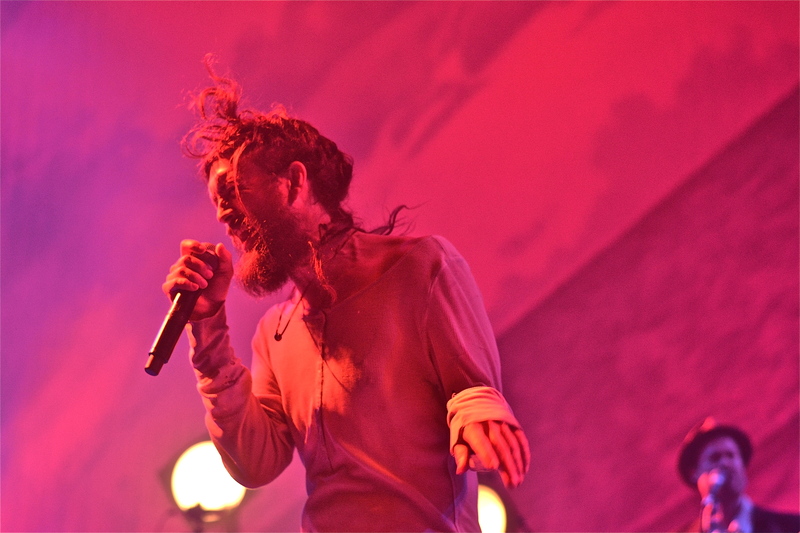 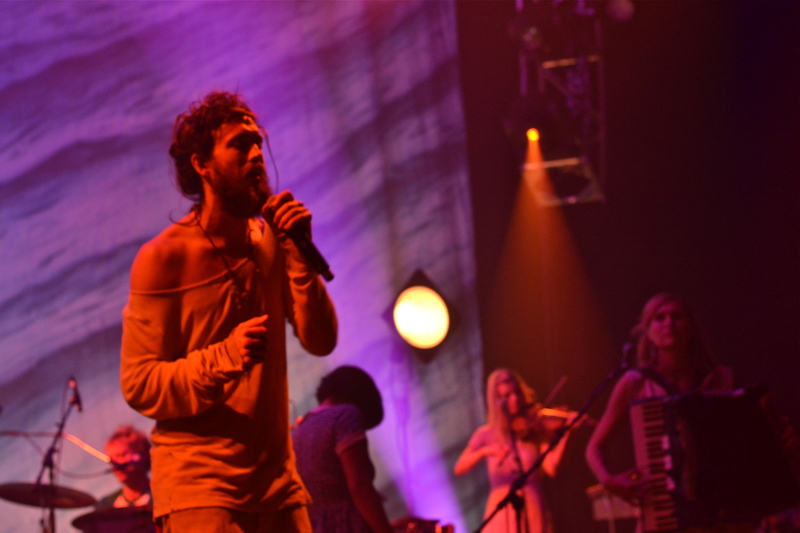 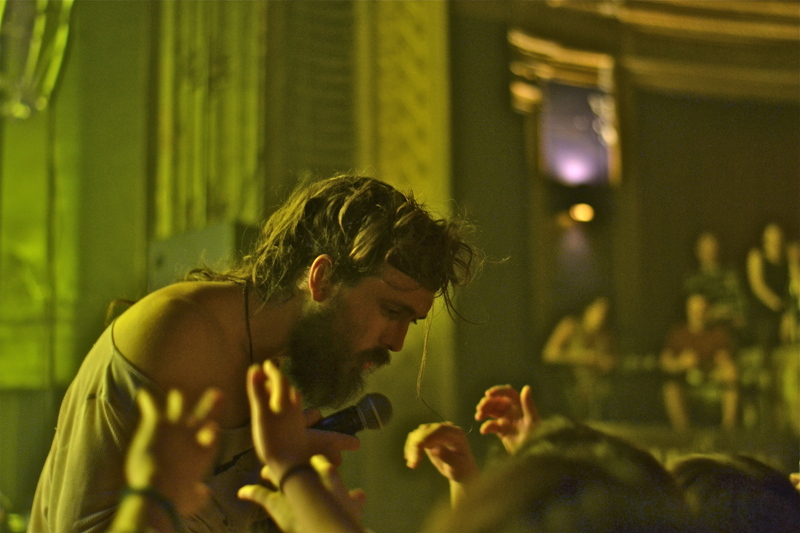 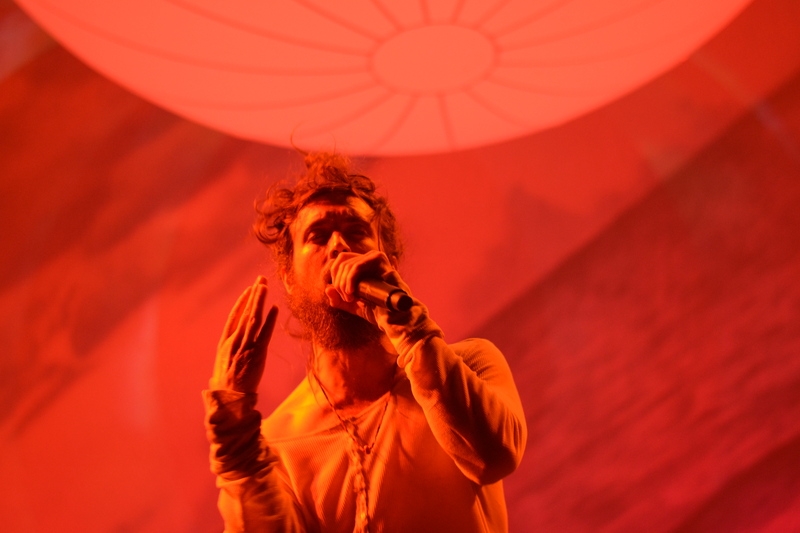 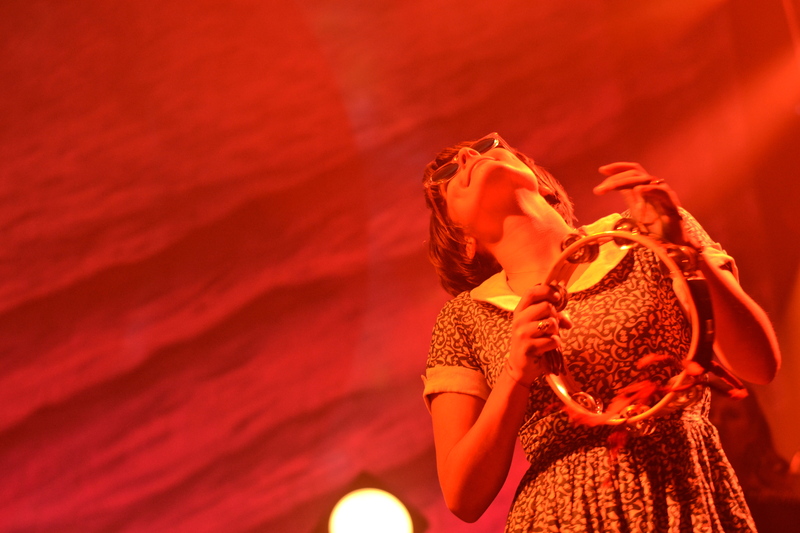 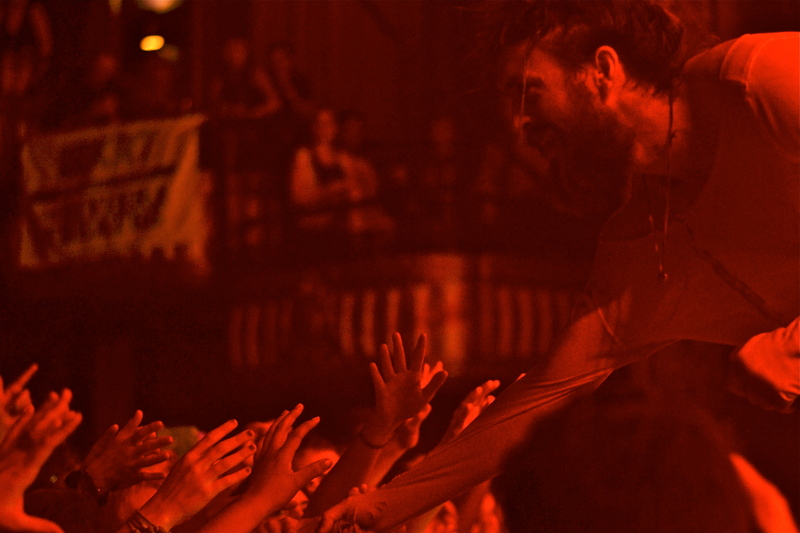 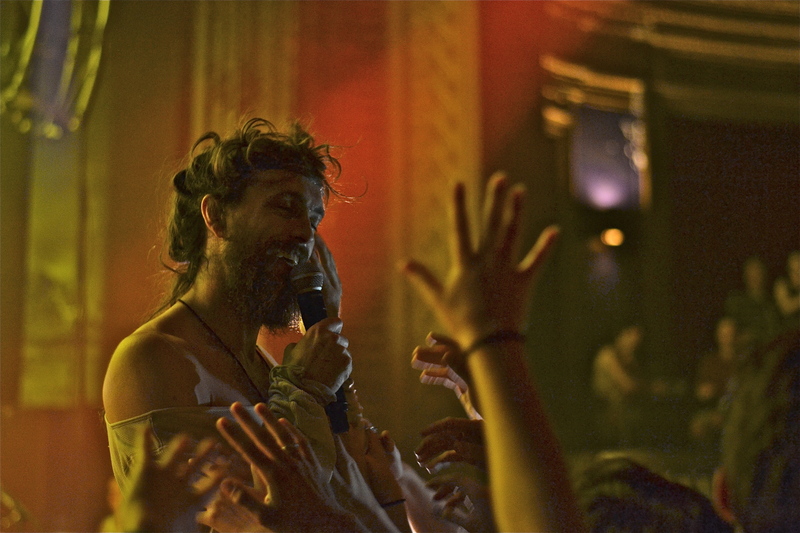 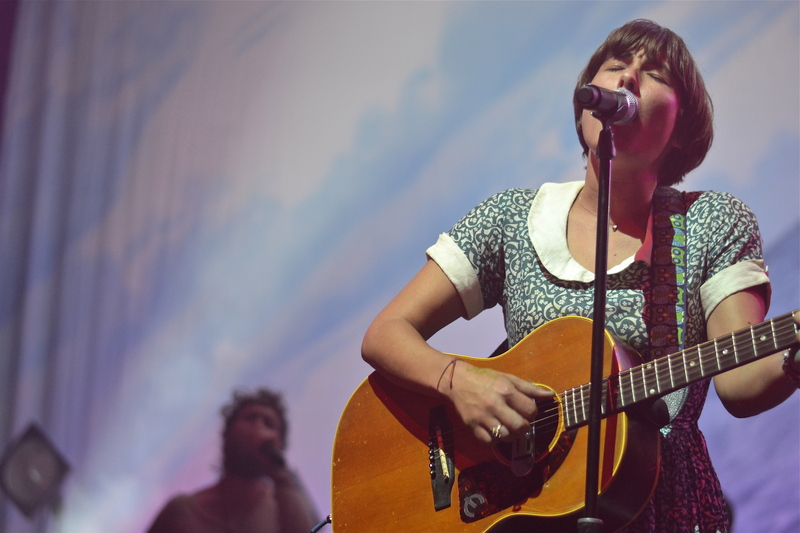 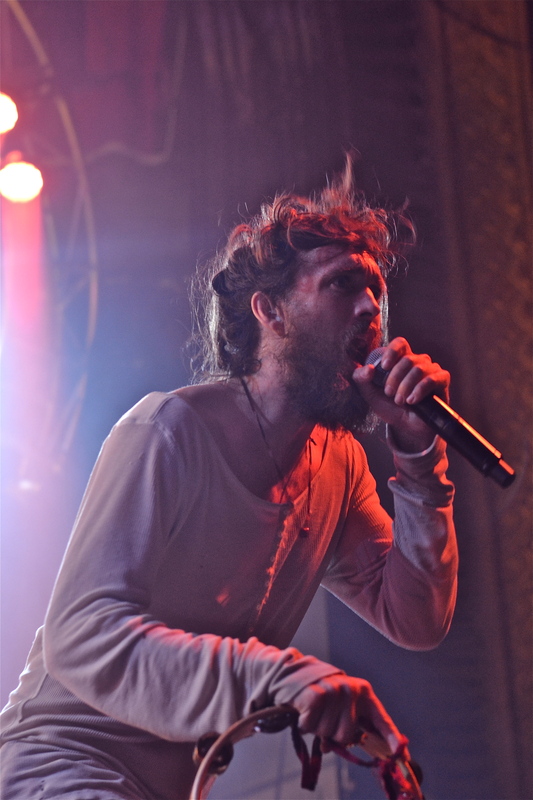 As fans later emptied out of the Riviera, it was clear that Edward Sharpe and the Magnetic Zeroes had left their charm and philosophy of “love, dance and be merry” on an enchanted crowd. 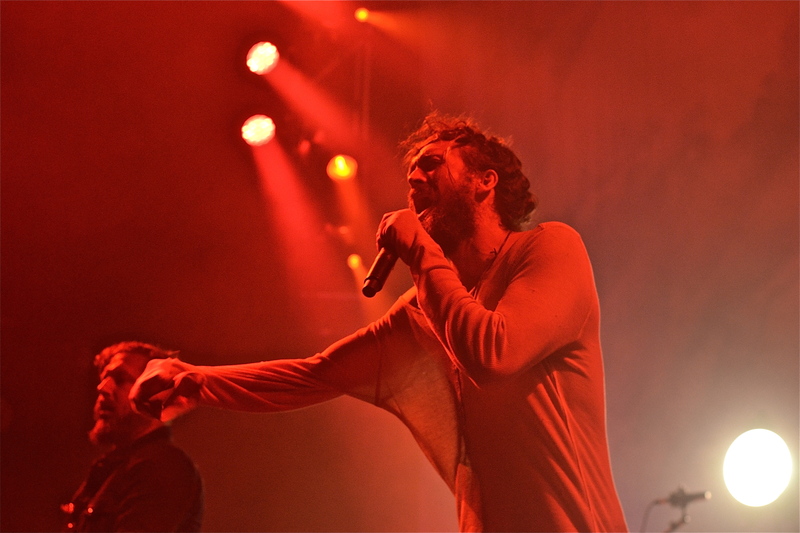 All photos by Maggie Bojda. 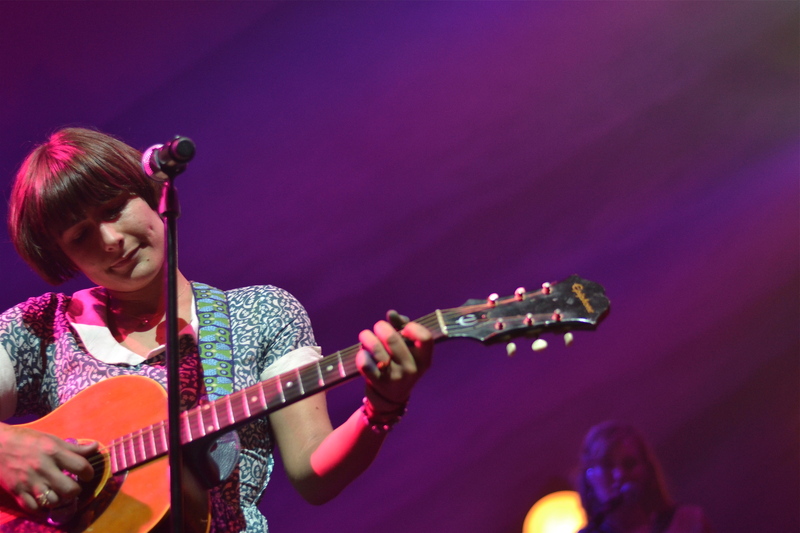 You can view the entire gallery from the show on our Flickr account here. 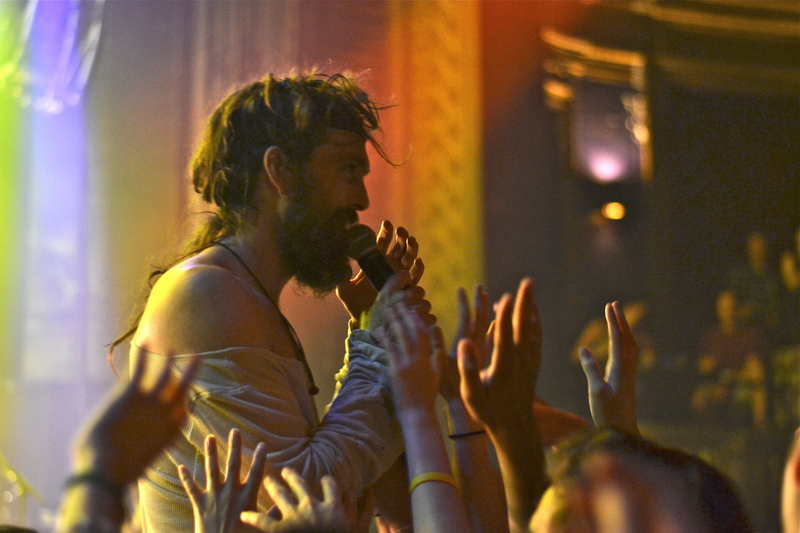 Sounds like it was an amazing concert, great pictures and good read!